An electrodynamical calculation of the global dynamo electric field. All four components of the CTIPe are run concurrently and are fully coupled with respect to energy, momentum, and continuity. The thermospheric code simulates the time-dependent global structure of the wind vector, temperature, and density of the neutral thermosphere by numerically solving the non-linear primitive equations of momentum, energy, and continuity on a 3D spherical polar grid rotating with the Earth. The latitude resolution is 2 deg, longitude resolution is 18 deg, and the vertical direction is divided into 15 levels in logarithm of pressure from lower boundary of 1 Pa at 80 km altitude. The equation of motion includes Coriolis effects, horizontal pressure gradients, horizontal and vertical viscosity, and ion drag. The non-linear energy equation describes horizontal and vertical advection of energy, horizontal and vertical heat conduction by both molecular and turbulent diffusion, heating by solar UV and EUV radiation, cooling by infrared radiation, and ionospheric Joule heating. The continuity equation incorporates three major species: atomic oxygen, molecular nitrogen and molecular oxygen and include chemistry, transport and the mutual diffusion between species. The high-latitude ionosphere convection model calculates field-aligned ion velocity components from the field-aligned momentum equation. The model includes chemistry, gravity, and ion-ion and ion-neutral collisional drag. 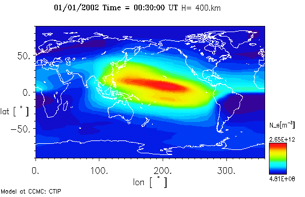 The ionosphere is computed self-consistently with the thermosphere pole-ward of 23 degrees latitude in both hemispheres. Transport under the influence of magnetospheric electric fields is explicitly treated, assuming ExB drifts and collisions with neutral particles. The plasmasphere model solves coupled equations of continuity, momentum and energy balance along many closed flux tubes concurrently. The orientation of flux tubes is determined by eccentric dipole approximation to the Earth's magnetic field. Each flux-tube is subject to ExB drift. Fixed or time-dependent Hemispheric Power in gigawatts and Hemispheric Power Index (activity level) during the simulated time interval interpolated on 12 minute temporal grid. 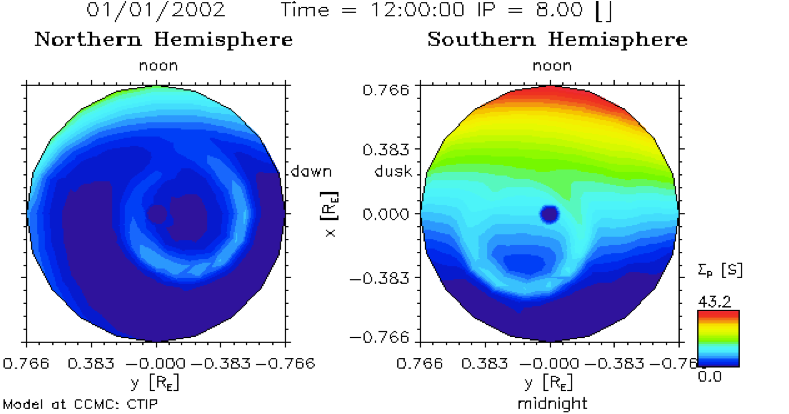 Data can be found at http:/www.sec.noaa.gov/ftpdir/lists/hpi"
Ionospheric electric fields: At the present time the CTIPe model is coupled with the Weimer ionosphere electrodynamics model which calculates ionospheric electric fields for solar wind parameters (density, solar wind velocity magnitude, IMF magnitude and clock angle) and Earth's dipole orientation provided as input on 12 minute temporal grid. For the selected time interval: Runs on Request submission interface input is automatically downloaded. ACE Level 2 solar wind data, Earth's dipole tilt angle, and NOAA/POES hemispheric power data is formatted for the CTIPe model. Neutrals: The three components are wind vector, temperature, the number density of ?the three major species O, O2, N2, and mean molecular mass. Ion and electron: H+, O+, electron number densities and temperatures over height range from 140 km to ?2,000 km, plus N2+, O2+, N+ below about 500 km. Height and electron number density of ?ionospheric F2 peak. Codrescu, M. V., T. J. Fuller-Rowell, J. C. Foster, J. M. Holt, and S. J. Cariglia, Electric field variability associated with the Millstone Hill electric field model, J. Geophys. Res., 105, 5265,5273, 2000. Fuller-Rowell, T.J., M. V. Codrescu, B. G. Fejer, W. Borer, F. Marcos and D. N. Anderson, Dynamics of the low-latitude thermosphere: Quiet and disturbed conditions, J. Atmos. Terr. Phys., 59, 1533-1540, 1997. Fuller-Rowell, T.J., D. Rees, S. Quegan, R.J. Moffett, M.V. Codrescu, and G.H. Millward, STEP Handbook on Ionospheric Models (ed. R.W. Schunk), Utah State University, 1996. Hagan, M. E., M. D. Burrage, J. M. Forbes, J. Hackney, W. J. Randel, and X. Zhang, GSWM-98: Results for migrating solar tides, J. Geophys. Res., 104, 6813-6828, 1999. Millward, G. H., R. J. Moffett, S. Quegan, and T. J. Fuller-Rowell, STEP Handbook on Ionospheric Models (ed. R.W. Schunk), Utah State University, 1996b. Mueller-Wodarg, I.C.F., A.D. Aylward and T.J. Fuller-Rowell, Tidal Oscillations in the Thermosphere: A Theoretical Investigation of their Sources, J. Atmos. Terr. Phys., 63, 899-914, 2001. Stanley C. Solomon and Liying Qian, Solar extreme-ultraviolet irradiance for general circulation models, Journal of Geophysical Research, 110, A10306, doi:10.1029/2005JA011160, 2005. Weimer, D. R., Predicting surface geomagnetic variations using ionospheric electrodynamic models, J. Geophys. Res., Vol. 110, No. A12, A12307, 2005.